2007年05月15日 00:44: Google 対 Yahoo! 2007年04月28日 14:14: MovableType Background Rebuilder Plugin(1.0RC2). 2007年04月23日 21:36: MovableType Background Rebuilder Plugin(1.0RC2)(1.0RC1). 2007年03月20日 02:13: MovableType Background Rebuilder Plugin(Beta8). 2007年03月10日 05:43: MT plugin Jaccessibility (書き直し版のさらに微修正!). 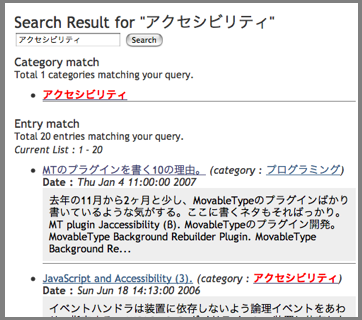 2007年02月10日 16:54: MT plugin Jaccessibility (書き直し版). 2007年02月09日 22:58: MovableType Background Rebuilder Plugin((元)最新版).